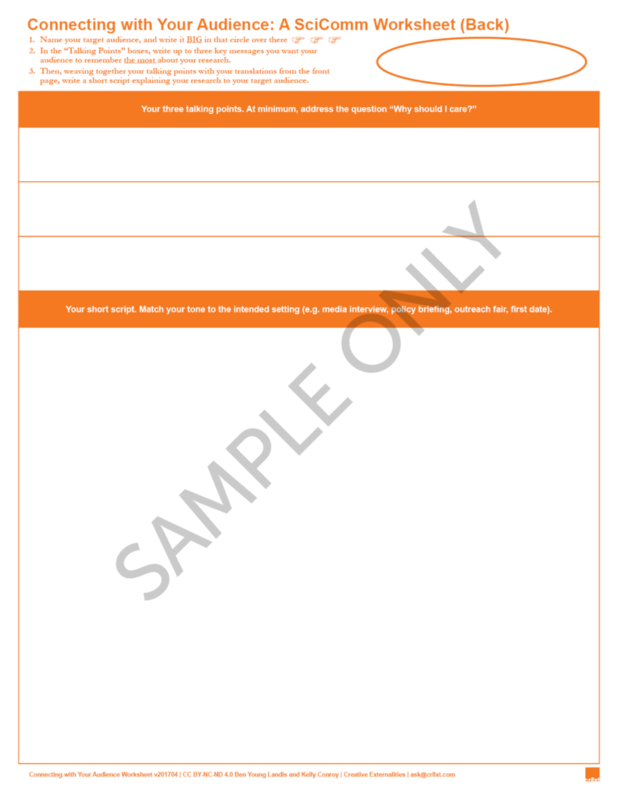 The Connecting with Your Audience Worksheet is a science communication worksheet created by Ben Young Landis and Kelly Conroy. This template improves upon classic scicomm worksheets by focusing on the audience — creating a better teaching tool to help research students and professionals frame their public message. The worksheet was designed to be as self-guided and user-friendly as possible, but it is most useful to those who have taken our Connecting with Your Audience Workshop (#CWYAscicomm), which expounds on the concept of understanding your audience. Here’s the story behind its design. A staple of science communications trainings is the worksheet. Every instructor or organization has a tool they prefer and tout — some kind of information scaffold to help scientists reframe and translate their knowledge into contexts that journalists or the general public can understand. Another staple of science communications trainings is the refrain “know your audience” — that is, you have to match your message and language to the audience you are speaking to, if you are to successfully convey your information. Yet, in many scicomm worksheet templates, there is no consideration of audience; at best, there is a blank line reminding you to write down a target audience. But there is usually no guided structure to help the user think constructively about that audience. What does my audience care about? What might they know or not know about my field of research? What values, issues, or places do they worry about? This always feels to be a major omission. I’ve always wanted to create a scicomm worksheet that could help scientists and topic experts better tackle the audience question. A worksheet that truly broke down the process of translating technical explanations into audience-tailored talking points and scripts — while remaining flexible and all-purpose. 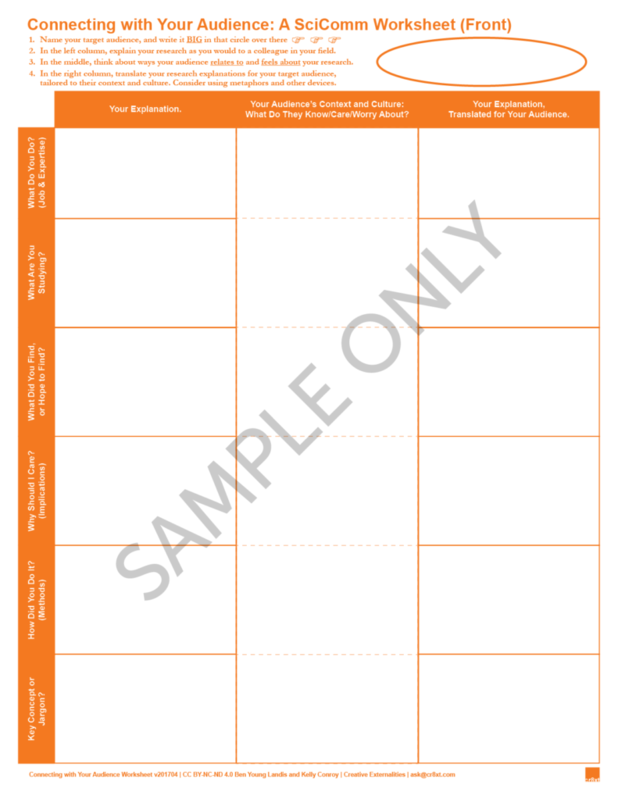 This worksheet was developed in tandem with the first edition of the Connecting with Your Audience Workshop (full story here). 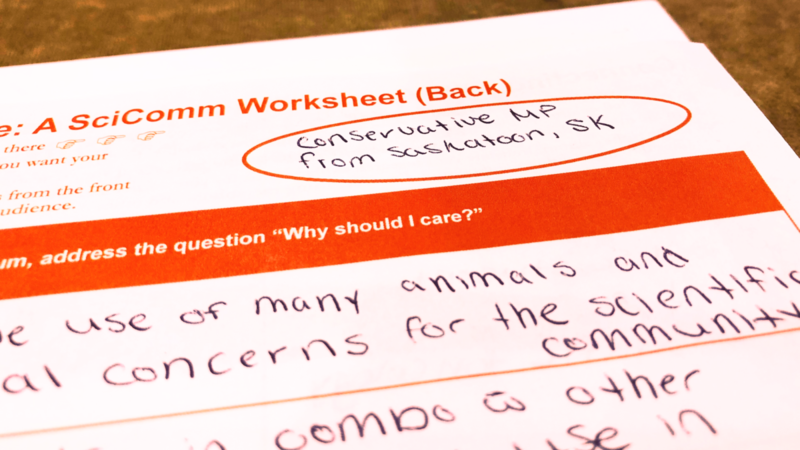 Indeed, the front side of the CWYA worksheet unifies the core concepts taught in the workshop — identifying a target audience, considering their context and culture, checking for jargon. However, the design innovation here is helping the user consider these steps via a step-wise matrix. The user’s first step is to plot out the elements of information delivery (e.g. what did I do; how did I do it; why should you care), as explained in their own words. Then the user is asked to imagine themselves as their audience, empathizing with their cares and worries. With this cultural context in hand, the user can now translate their original, technical explanation into language better suited for their audience. Finally, with the talking points in hand, the user can weave all available elements into a short script that effectively engages their target audience and communicates the relevance of their research or expertise. I am grateful to have the ear, eyes, and heart of my thoughtful friend and colleague Kelly Conroy in bringing the CWYA worksheet to life. Kelly has a wonderful sensitivity and empathy that fuels her professional work and her way of life — something I admire and share. I think what we’ve proven here is that we can improve how we teach the technique and art of communicating science — by creating a logical framework to capture the abstract and the emotional. We hope this worksheet can help many of you better communicate your great knowledge to public audiences, and, in turn, inform and inspire others more still. The Connecting with Your Audience worksheet is available as a free download. We encourage research students and professionals to use it and share it — widely! Give attribution. Please credit authorship of this worksheet as “Ben Young Landis and Kelly Conroy”. You may do so in any reasonable manner, such as crediting us on a presentation slide or webpage, but not in any way that suggests the we endorse you or your use unless we have!). You must also display the Creative Commons license — so your text might read something like “Created by Ben Young Landis and Kelly Conroy. Shared under Creative Commons License CC BY-NC-ND 4.0“. Avoid commercial use. You may not use this worksheet for commercial purposes, such as teaching your own fee-based workshop. We reserve all rights for the commercial use of this worksheet and related curriculum. Not create derivatives. You can only redistribute this worksheet in its originally form. If you remix, transform, or build upon this worksheet and its design, you may not distribute the modified file. Additionally, we would love it if you listed Creative Externalities and linked to this webpage or our email (ask@cr8xt.com) in any “For More Information” language. Thanks! Additional worksheets with completed example solutions for different audiences are available to participants of the Connecting with Your Audience Workshop.